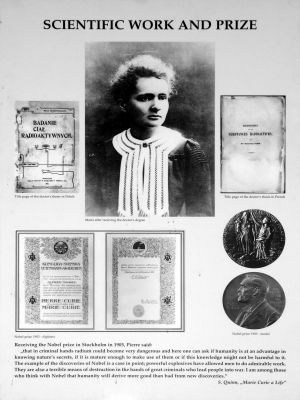 Maria Skłodowska-Curie has been proclaimed the patron of the year 2011 by both chambers of the Parliament of the Republic of Poland. A century after she received her second Nobel Prize her life and achievements continue to inspire generations of scientists. In spite of all odds – lack of financial resources, difficulties in finding employment and the misogyny of the academia – Maria Skłodowska-Curie managed to pursue one of the most extraordinary careers in science. She was the first woman in Europe to obtain a doctorate in physics. Her discoveries helped to lead physics to the realm of quantum mechanics and eventually paved the way to the formulation of the Standard Model of electroweak and strong interactions. It is appropriate to reflect upon this, just before the big leap in the understanding of the structure of matter that will be most probably brought about by the LHC results. Maria Skłodowska-Curie did not spare efforts to make the world a better place to live. In her early years, she provided (illegally) free elementary tuition to peasants‘ children. During World War I she used her experience to fit ambulances with x-ray equipment and to train their personnel. When she became a public figure, she used her celebrity status to raise money for the Radium Institute in Warsaw, a state-of-the-art center of oncology. Maria Skłodowska-Curie was born in Warsaw and her first laboratory was situated a few hundred meters from the conference site. Therefore, the conference will be preceded by a special session devoted to this great scientist. This event will be held on August 25, 2011.